In today’s world the dangers of sun exposure as they relate to skin cancers and aging of the skin are common knowledge. The aging side of the issue was further supported by a case study published in the April edition of the New England Journal of Medicine. A patient seen at Northwestern Medical Center in Chicago was 66 years old on the right side of his face and 86 years old on the left side. He had been a truck driver in Chicago for 30 years delivering milk to stores and gas stations between 6am and 3pm. Since the vehicle did not have air conditioning he kept the driver’s side window open most of the time. After about 15 years of this he recalled always being more tanned on his left arm than his right arm. Sunlight contains ultravioletA and ultravioletB light rays. The UVB causes sunburns and is blocked by glass and most sunscreens. UVA penetrates through glass and causes photoaging of the skin it is not blocked effectively by sunscreens that do not contain titanium dioxide or zinc oxide. Skin cancers can be caused by either UVA or UVB or both working together. This fact is why the FDA has made sunscreen labeling rules more restrictive. Only sunscreens containing titanium dioxide and/or zinc oxide can claim skin cancer prevention on their labels (as described in my 2008 blog Suntanning, Tanning, Sunscreens). 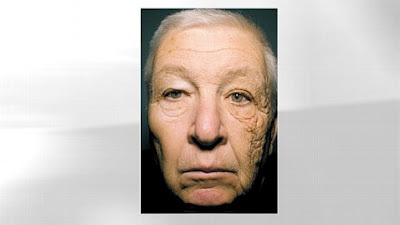 If the Chicago truck driver had regularly used sunscreens his facial aging would have been more symmetric and his grandchildren would not be asking “what are these bumps, grandpa?” on the left side of his face. Some 10 to 15 years ago I myself developed a precancerous skin lesion of the left lower eyelid near the nose. The southern California UVA penetrated through the driver’s side door window bounced off my sunglasses hitting that area of the lower eyelid. I had it removed by laser so you cannot see where it was but have been bathing in sunscreen every morning since. I also had a patient who drove a truck in southern California for decades without sunscreen. Once he reached his late 50s early 60s he had had so much skin cancer surgery that he was missing parts of his ears and his face was a patch work quilt of skin grafts and flaps. Opioid Prescriptions and Pain Following Surgery.